I've just spent a few days out and about, so this week's photos reflect some of what I've been doing. 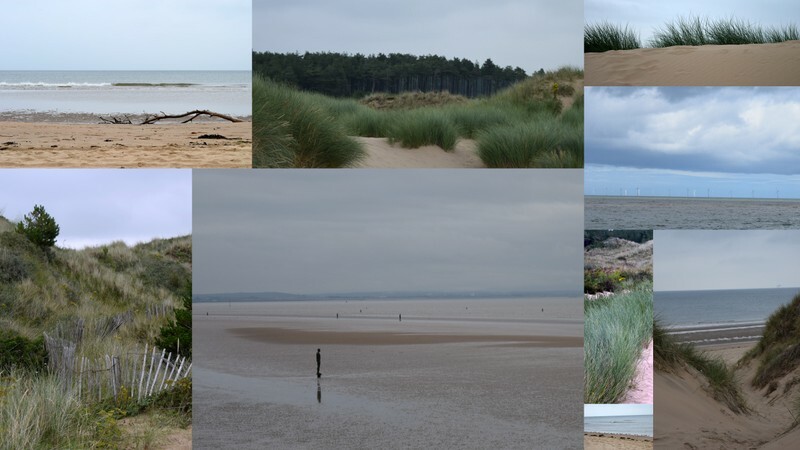 These photos were taken on the coast just north of Liverpool - at Formby and Crosby. I've seen sand dunes, wide, open beaches, Anthony Gormley's Another Place and more besides. There have been lighthouses too, which I think I'll save till next time. Since we somehow, inexplicably, findourselves in August already I am linking up again with Wandering Camera over at Soma's Whims and Fancies. I think I need a trip to the beach just to feel rebalanced. Certainly to cold for swimming in NZ at this point. Looks like nice relaxing places. Thanks for sharing your beautiful photos. I love those names, Formby, Crosby, Anthony Gormley, fun to pronounce. Long time since I was at Formby!! Your beach photos take me back, lovely long stretches of sand. Oh you lucky thing Kaja - I'd absolutely LOVE to see the Gormley, it looks so serene, even under grey skies! My favourite walk with the dogs is along a beach that looks very much like this! I know how much you love the beach, so glad you got to visit. You captured some really lovely photos too. The colours are so soft and relaxing. Thank you for linking up on Wandering Camera, Kaja!